This article will share a partition tool which can redistribute hard disk to extend C drive system partition on Windows Server 2003. Download IM-Magic Partition Resizer Server to resize hard disk since system partition has insufficient free space on Windows 2003. Have you ever run into problem that system partition is running out of disk space on Windows Server 2003? Do you have any solution to fix the low disk space on Windows Server 2003 system partition? In fact, only a partition software is needed if you want to resolve the problem thoroughly when system partition runs on low disk space on Windows 2003. 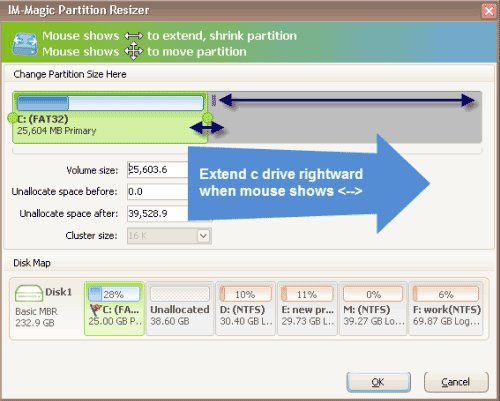 IM-Magic Partition Resizer Server can redistribute hard disk and reallocate disk space without repartitioning hard disk. This partition software can work on Windows Server 2003 and other Windows Servers to help resize hard disk without deleting or moving original data. When mouse shows double arrows symbol, you can move the arrows to shrink the selected partition so as to squeeze some unallocated space. You need to move the unallocated space close to system partition. Then, you can right click system partition and choose "Resize/Move" option. Move the arrows to extend system partition and then click "Apply" button. 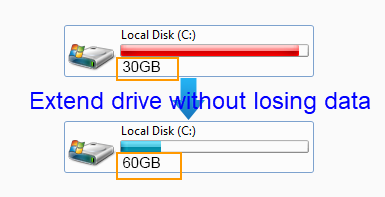 Why Need to Extend System Partition? "There is about 80GB space on C drive in total, but only has less than 1GB free space left. I didn't pay much attention to it when Windows 2003 system shows low disk space warning message on this drive. However, recently my computer runs slower and slower. I don't know if it is caused by the C drive low disk space problem, but somebody says that it may cause much trouble if C drive keeps running on low disk space. So I want to increase the size of C drive on Windows 2003. Can anybody give me some help?" "My PC runs on low disk space on system partition. Do I need to repartition hard disk? If I repartition the hard disk, I need to backup data and reinstall system. I don't want to spend lots of time to do so much work. I am wondering if I can simply reallocate some free space to system partition on Server 2003." It is unnecessary to spend much time to backup data, reformat hard disk and reinstall operating system to reallocate disk space. As a matter of fact, you just need to use partition software to redistribute free space to system partition when it runs on low disk space. By using this software, you can simply move free space from other partition to the system partition. The IM-Magic Partition Resizer Server enables you to squeeze free space from any partition on the same hard disk by shrinking the partition. This partition software does not deleting or modifying any data from original place during partition resizing. Have you ever installed any virtual machine on your PC? Virtual machine enables your PC to run in a virtual environment. If system partition C drive is running out of disk space on Windows Server 2003 in VMware, do you need to reinstall VMware? IM-Magic Partition Resizer Server also allows you to resize hard disk in Windows Server 2003 VMware, so you have no need to reinstall Vmware when C drive is running on low disk space. C drive is running out of disk space on Windows 2003 RAID 5? IM-Magic Partition Resizer Server can work on RAID 5 array to redistribute disk. You can add new disk to increase the size of RAID 5 array, or you can also squeeze free space from other partition on the RAID 5. If you need to add new disk, you should make sure if the new added disk can be compatible with the RAID 5 array. This partition software can resize RAID 5 system partition C drive and data partition without any influence on the operating system or the array.